MRSA is a short name for Methicillin-resistant Staphylococcus aureus bacteria. This term actually designates any strain of Staphylococcus aureus bacteria that is resistant to methicillin. Methicillin is an antibiotic, similar to penicillin. 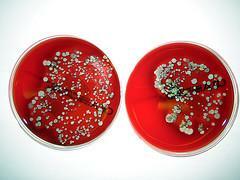 However, in many cases, MRSA is resistant to other types of antibiotics, as well. Therefore, it is often called a “superbug” which is a name that nicely describes its ability to survive even the most aggressive antibiotic treatments. This bacterium causes a lot of troubles in hospitals and other medical institutions, full with patients with weakened immune systems and open wounds, where infection easily spreads from one patient to another. MRSA infection starts as a small red bump that may look like a pimple, boil or spider bite. In up to 48 hours, this small superficial irritation may turn into a deep painful abscess and even require a surgical draining. After only 72 hours, it can take hold in human tissues and even become resistant to treatment. This is the most dangerous stage of the disease, in which bacteria gets deep into the tissues, and starts affecting the bones, joints, surgical wounds and even the bloodstream. Bacteria easily spread all over the body and may even lead to shock and death. Treatment for MRSA is very complex. Even though the bacteria have developed resistance to many antibiotics, antibiotic therapy is still the primary treatment against MRSA. When local infections progress to abscesses, therapy will also involve draining the abscess and applying topical medication. Antibiotics are given to the patient, and they should be taken continuously. Discontinuing the drug can lead to further resistance and relapse of the infection. MRSA infection is usually treated using the antibiotics that have been shown to be effective against this bacterium. These antibiotics include clindamycin, daptomycin, doxycycline, linezolid, minocycline, tetracycline, trimethoprim-sulfamethoxazole, and vancomycin. Patients will typically start with the treatment in the hospital, but they will be required to continue taking medication, even after they are released home. During their hospital stay, many additional treatments may also be required. These treatments usually include fluids, kidney dialysis, oxygen treatment, and treatment for systemic infections like blood poisoning. Hospitalized patients are normally isolated from other patients, since this is proven the most effective way to reduce the risk of spreading the infection. Hospital staff is also required to follow strict sanitary procedures before and after the contact with patients infected by MRSA.